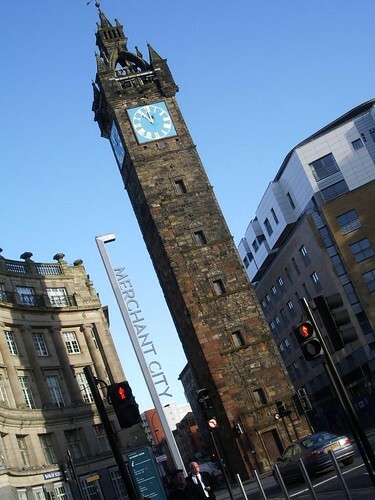 Just opposite the Tollbooth (see yesterday) on Trongate is the clock steeple. The building was originally the Tron church, but it has now been redeveloped into a theatre (called, unsurprisingly, the Tron). It really stands out among the more modern shops and amusement arcades and the like (the north side of the street, opposite this, is still in need of some considerable development). The Panopticon (featured a couple of weeks ago) is just up the road from here. Weather watchers take note: this picture was not taken yesterday (grey, very wet, miserable, the usual)! 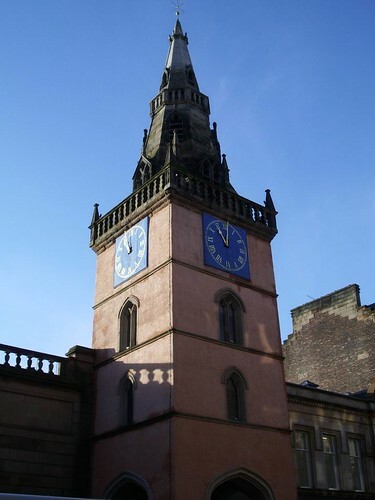 This is one of only three crowned steeples in the country, and is all that remains of the 17th century tollbooth at Glasgow Cross, at the heart of Glasgow’s Merchant City (the former centre of administration and trade for the city). The original tollbooth was built in 1626 and also housed a prison and courthouse (as described by Sir Walter Scott in “Rob Roy”). A commenter on this picture in flickr also thought that hangings took place here, which wouldn’t surprise me given that it was a prison and courthouse. I’m sorry I haven’t been visiting other photo blogs recently, real life has taken over a bit – as it tends to from time to time! I do hope to be able to catch up this week though! 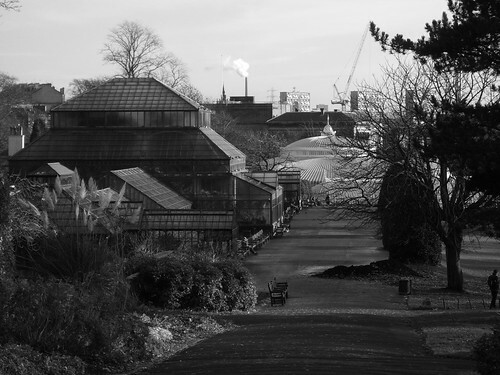 Here is another view from the Botanic Gardens – in the foreground is the glasshouse, then the Kibble Palace. Behind that is the old BBC studio in Queen Margaret Drive, and the chimney spewing smoke (quite a Glasgow landmark – I’ve got a few pictures of that lined up) is a whisky distillery. 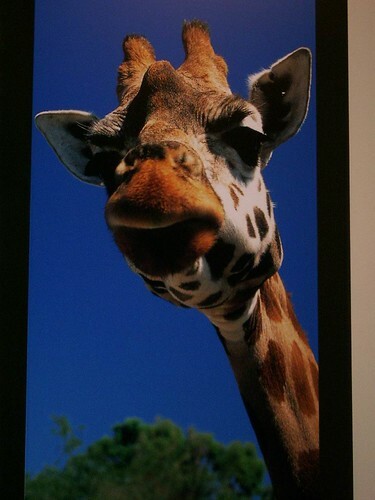 Not that I’m obsessed with the Kelvingrove and giraffes, but this picture is also at the Kelvingrove and it always makes me smile. Happy Saturday! 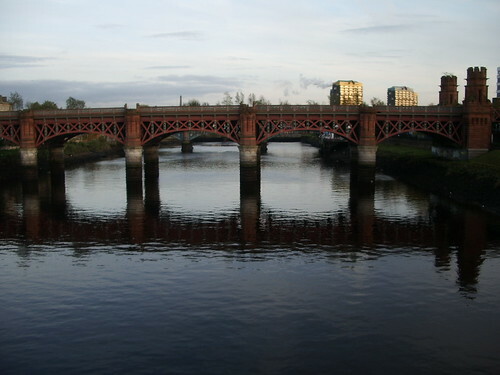 This bridge over the Clyde, looking east (just past Glasgow Central Mosque) always strikes me as a bit of a sad sight. You may be able to make out the plants growing now that they no longer have trains running over them. This bridge stretches a fair way south of the river, and the plants grow right along it. 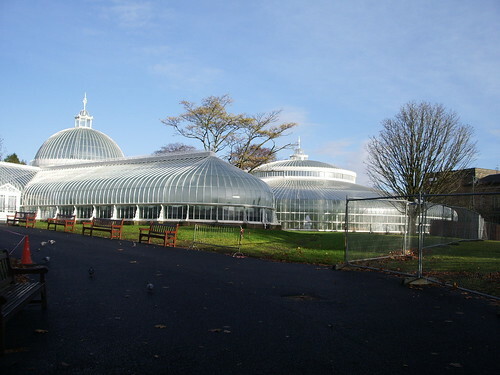 I’ve shown the Kibble Palace, in the Botanic Gardens, before. Here’s another view, as you approach it from the Great Western road entrance to the Botanic Gardens . This statue, at the top of Buchanan Street, is of Donald Dewar, the first First Minister of Scotland following the formation of the devolved Scottish Parliament in 1999. He died the following year. He remains one of Scotland’s most respected politicians, though he was by all accounts a modest man. 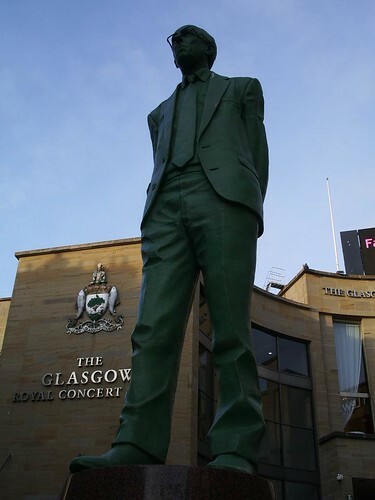 The statue was unveiled by Tony Blair in 2002. After restoration in 2005 it was placed on a 6foot high plinth to try to deter vandals. The title of this blog entry, “There Shall Be A Scottish Parliament”, is inscribed around the plinth – they are the opening words of the Scotland Act. This is another Glasgow curiosity – the Mackintosh House, part of the Hunterian Museum of Glasgow University. Charles Rennie Mackintosh and his wife Margaret MacDonald lived at 78 Southpark Crescent (just up the road) between 1906-1914 and extensively remodelled it. The University bought the property in 1946 (including the original furniture), but in the 1960s it had to be demolished due to subsidence, so as much as possible was salvaged, and the house was recreated up the road, with as many of the original fittings and designs as possible. There’s more information, and a virtual tour, here . 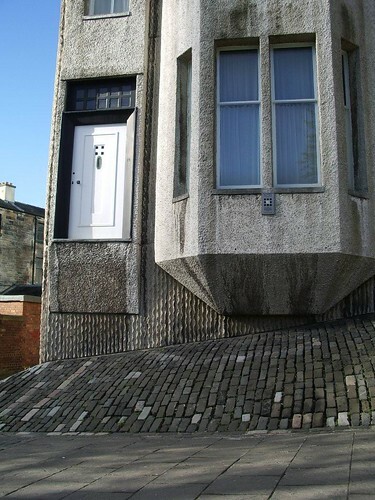 I’m guessing you have to be rather tall to enter through this front door! (access is actually via the Hunterian Museum entrance, which is just off to the right of the picture). 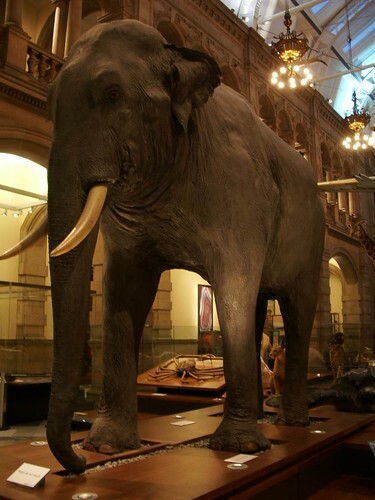 This little fella is found in the kids section of the Kelvingrove Museum, and is one of my favourite exhibits. 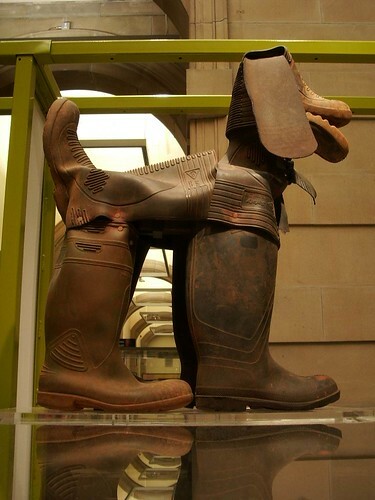 It’s quite a well-known exhibit (I’ve heard a few people randomly talk about it) but I can’t find any information on who created it, so if any of my more knowledgeable commenters know I’d love to find out!